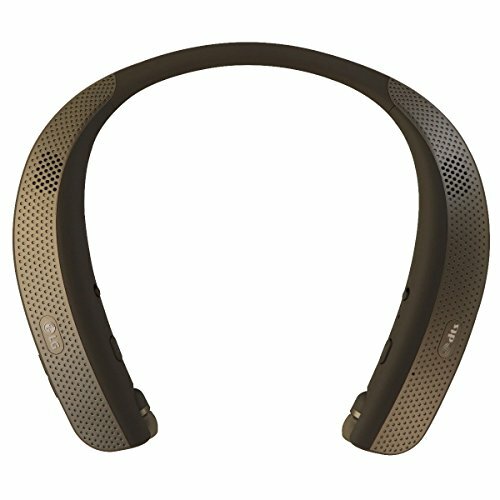 Combining portability and immersion with rich volume and theater-quality sound, the LG TONE Studio is a unique, around-the-neck Bluetoothwearable speaker engineered to provide clear personal surround sound and a true sensory experience - perfect for music, gaming, movies, TV shows, phone calls and so much more. Real 3D Surround is delivered through four speakers arranged in ideal positions on the neckband to create the world's first-DTS-tuned sound experience designed for a wearable headset. So no matter where you are, with the Tone Studio on you remain in the surround sound zone. Wearable Bass special vibration speakers allow your body to feel the sound in low-bandwidth, as if you were right there in the heart of the action. It also features premium Hi-Fi DAC and the ability to block out background noise for clearer dialogue, which is a powerful solution for any audiophile or those who may need assistive listening while watching television or on the phone. Plus with the retractable earbuds, you have the choice of using the TONE Studio as a wearable speaker or using the earbuds for a more private audio experience. So sit on the couch or take LG's top-of-the-line wearable on a stroll - wherever you go, you'll remain at the center of your entertainment. * Talk Time - Up to 40 hrs (Earphone Mode); 16 hrs (Speaker Mode). * Music Time - Up to 35 hrs (Earphone Mode); Up to 6 hrs (Speaker Mode). * Standby Time - Up to 61 Days. * Charging Time - Less than two hours. * Dimensions - 7.6"(W) X 6.9" (L) X 0.7"(H). Personal Surround Experience - combine immersion and portability with the true experience of high quality sound and rich volume. Real 3D Surround Sound - 4 strategically placed speakers designed to deliver the best in dimensional surround sound. Haptic User Experience - Wearable Bass maximizes the sense of immersion with special vibration speakers that engage your entire body in low bandwidth. Sound Designed by DTS - experience the first DTS-tuned wearable wireless device for "cinema-like" surround sound. Dual Play - connect two LG TONE Studio devices simultaneously to share the sound experience.